Offense-schmoffense, when push comes to shove there’s no penalty for eating an opponent. 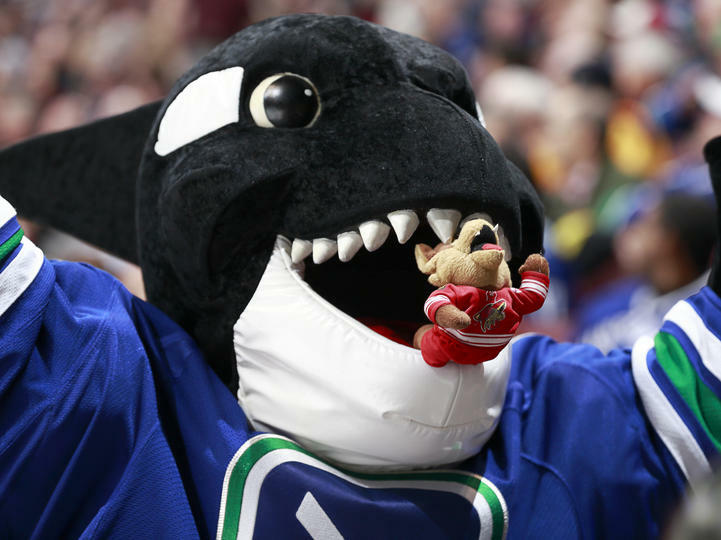 For the second time in just 10 days, the Canucks take on the Phoenix Coyotes. You may or may not remember their most recent meeting on January 16th. On the one hand hand, it was memorable for the sole reason that Martin Hanzal was a one-man wrecking crew for the Coyotes in the third period, taking out with Henrik Sedin, Mike Santorelli and David Booth with crosschecks. But then again, the game was boring as heck so we’ll forgive you if you stopped watching before Hanzal went all Donatello on the Canucks. None of the three injured Canucks finished the game, and in fact, Hank and Santorelli remain out of the lineup, which has Dale Weise speculating some sort of response to Hanzal. “I think we’re trying to build a team identity here that we don’t get pushed around,” Weise continued. “I think we stood up for ourselves good against Calgary. Dustin Brown kind of had to answer the bell there — and he did. I don’t think Dustin Brown had to drop the gloves but he was forced into it. Eventually if you get enough guys challenging you, I think the peer pressure kind of wears on you and you have to answer the bell. Like against their games against the Los Angeles Kings and Anaheim Ducks the other week, the Canucks can’t let their emotions get the better of them. The Coyotes are hot on the Canucks’ tail in the Western Conference for the last playoff spot in the Western Conference; the Canucks have a slim 4-point lead on the Desert Dogs, who also has a game-in-hand on Vancouver. If there’s any positives for the Canucks, it’s been their goaltending. They’re not scoring, but they’re staying in games thanks in large part to Roberto Luongo and Eddie Lack, both of whom are in the top 10 in the NHL in GAA and save percentage. The Canucks have the 7th best goals against per game in the league (2.38), and Luongo, specifically, is looking better than ever and has a 0.949 save percentage in his last 4 starts. Up front, tough guy Dale Weise has 2 assists in his past 2 games, and for the Coyotes, Mike Ribeiro, who leads the Coyotes in scoring, has 4 points (2 goals and 2 assists) in a 3-game point streak. Henrik Sedin remains day-to-day with a rib injury and is expected to miss tonight’s game. Mike Santorelli remains out with a shoulder injury and Andrew Alberts remains out with a concussion. Jordan Schroeder, who has missed most of the season with an ankle injury, will not play tonight, but did start his conditioning assignment and played for the Utica Comets on Friday and Saturday against the Abbotsford Heat. With all the money Canucks spent on top forwards, you would think one of them could lend us a buck to buy a goal.